In this internet age, every business strives to keep up with the fast-evolving web arena. Physical companies are either switching to online models or are embracing digital marketing, to ensure that they remain relevant. And let’s face it; online marketing is indispensable for anyone seeking to market their brand successfully. Whether you have an already established business enterprise, or you’re just starting out in the world of business, an online presence should be a priority. And marketing in the web world has never been easier, with tons of marketing agencies online. All you need is to pay them, and they do everything as regards online marketing, on your behalf. The following are just some of the reasons why a digital market is essential for your business. With the internet, almost everything is possible. From purchasing home electronics to buying a movie ticket, the internet has completely revolutionised our way of life. Online marketing expands the visibility of your products and services, not only to your local market but to the entire world. By presenting your business to internet users, you will have no limits, when it comes getting your market share. The rule is simple; stage a proper online marketing campaign, and your brand will be up there. Back in the day, it was a common belief among small business owners, that online marketing is a preserve of big corporations, with enough resources needed to mount serious marketing campaigns online. However, those days are long gone. 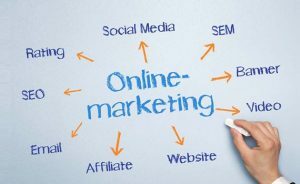 Online marketing provides a level playground, giving small and medium businesses the opportunity to get their fair share of the online market because they are able to compete favourably with the market giants. Online marketing makes it easy to connect with your existing and potential customers and interact with them in real time. When your customers interact with your business, they expect to get a response, which could be a valuable piece of information that goes a long way, in determining their next step. For instance, when your customer is seeking to know the availability of a particular product or service, via a social medium, your business agents need to be on red alert, to ensure that the customer receives an answer, within the shortest time. Potential customers may want to know more about a product before they make up their mind to purchase it; hence, the required information should be provided as soon as possible, or you risk losing out on many customers. Since its beginnings, the internet has always been a hit, and chances are that it will remain that way, for the foreseeable future. In fact, everyone today seeks to establish their presence online, and that’s why many people, let alone businesses, have social media profiles. For small businesses, and also those that are just starting up, an online presence is essential, because it communicates a compelling message to customers; the customers will know that the company has the willingness to grow, which actually builds customer trust. Naturally, human beings go for things that they can get quickly. The internet makes virtually everything easy. It makes it easy for customers to access your products or services from wherever they are, via their mobile devices. This implies that your customers can purchase what they want, at any time, and this leads to increased sales.